Collimation is the process that allows you to align the optical components of an instrument: in this way you can get the maximum performance from a telescope. If the optics are not aligned, in fact, the images lose contrast and the stars will be no longer point (often they assume an elongated shape). Some optical schemes (such as refractors) are collimated at the factory and do not require (except in rare cases) changes. For others, such as Newton (particularly those with short focal ratio), it may be necessary to make collimation more often and carefully. The Cheshire collimating eyepiece helps you to get a precise collimation in a short time and with greater ease. The collimation can be done during the daytime paying attention not to point the telescope toward the Sun. This Cheshire collimating eyepiece requires that primary and secondary mirrors are properly installed in their supports. So make sure that the secondary mirror is correctly positioned in the center of the tube (if necessary, take a ruler and measure the distance between the center of the secondary support and tube in different directions), and that the primary mirror is also at the center of tube. Remove the caps of your Newtonian telescope and observe within the telescope's focuser with no eyepiece inserted into the focuser itself. If both mirrors are not aligned, you will see something similar to the image shown here. Then enter the collimation eyepiece in the focuser and rotate the eyepiece collimation in such a way that the opening (the one with the angled silver part) is facing a light source. 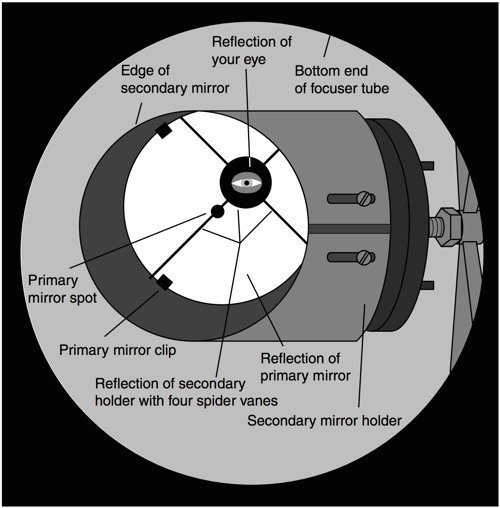 Note that now the field is limited (to improve the quality of collimation) and that, in place of your eye, you now see the reflection of collimation eyepiece. Check first of all that the secondary mirror is perfectly aligned with the focuser. To do so, observe the position of the crosshair eyepiece collimator with respect to the center of the secondary mirror. If the center of the secondary mirror is not perfectly at the intersection of the crosshair, adjust the position of the secondary mirror (STEP 1). Now we have to adjust the tilt of the secondary mirror. 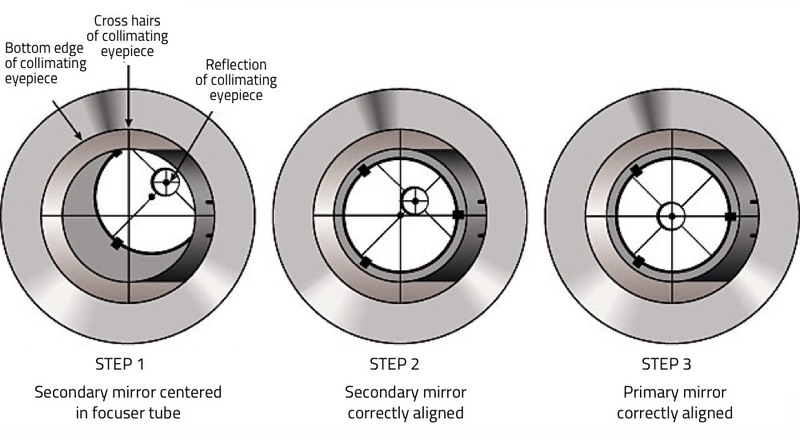 Use the 3 collimation screws on the secondary mirror support until the reflection of the primary mirror is perfectly centered (STEP 2). Do not worry about the reflection of the secondary mirror, it will set in the next step. Let's move on to the adjustment of the primary mirror alignment. Using the three screws located behind the primary mirror cell (rotating them one at a time), move the reflection of the secondary mirror in the center. The point at the center of the primary mirror should be exactly centered (STEP 3). If everything is centered, the telescope is collimated!